Bobby Flay’s versatility is evident in the multiple talents he brings to the field as a chef, restaurateur, cookbook author and media personality. Bobby discovered his culinary identity at the age of 17, working as a cook at the famed theatre district haunt Joe Allen’s. The job had been arranged by his father, who was a partner in the restaurant. After a short time, Joe Allen himself became so impressed by Bobby’s talents that he paid the young cook’s tuition to the French Culinary Institute. Following his graduation in 1984, Bobby worked with restaurateur/owner Jonathan Waxman at Buds and Jams, where he first discovered the sweet heat of Southwestern ingredients. It was at these burgeoning restaurants that he met other icons of the era – Wolfgang Puck, Jeremiah Tower — whom he credits with spawning an entire generation of chefs. After Jams, Bobby debuted as Executive Chef at the East Village’s Miracle Grill, where he caught the attention of restaurateur Jerome Kretchmer. Kretchmer offered the 25-year-old the opportunity to create his own sensation at Mesa Grill, which opened in 1991. Soon after, Bobby teamed with businessman Laurence Kretchmer to open Bolo in November 1993 in the Flatiron District. During Bolo’s reign, Bobby drew inspiration from the bravado and complexities of Spanish food, deftly blending the unique flavors of Spain with more familiar American ingredients. A decade later, its menu reenergized by the introduction of tapas, Bolo was awarded a rare three stars by The New York Times. Bobby brought his unique amalgam of innovative food and inviting hospitality to Las Vegas with the 2004 opening of Mesa Grill at the legendary Caesars Palace. The city’s upbeat urban energy provides an ideal backdrop for Mesa Grill’s lively cuisine. At New York’s Bar Americain, which opened in March 2005, Bobby takes the intimacy of a midtown brasserie and injects it with authentic American flavors and style. Drawn exclusively from regional American ingredients, his dishes rejuvenate old classics and celebrate the abundance of America’s diverse and delicious heritage. Bar Americain has received rave reviews from the press, including two stars from The New York Times. Bobby Flay Steak, which opened in July 2006 in Atlantic City, is Bobby’s first-ever steakhouse. Here, he presents classic steakhouse fare that he remembers enjoying as a child in New York City and on the Jersey Shore as well as new dishes that incorporate his famous grilling techniques and signature Southwestern fare. In March 2007, Bobby brought Mesa Grill to The Cove Atlantis in Paradise Island, Bahamas, and in July 2008, opened his first Bobby’s Burger Palace (BBP) in Long Island. At the BBP, Bobby presents an array of burgers inspired by his extensive travels throughout America and his love of the grill in a convenient casual setting. The second outpost of the BBP opened in December 2008 at the Monmouth Mall and the third BBP in the Bergen Town Center in Paramus, both in New Jersey. In 2009, Bobby brought two of his restaurants to Mohegan Sun in Connecticut: a fourth BBP opened in July, and Bar Americain opened in November. Bobby opened his fifth BBP location in 2010 in Philadelphia on the University of Pennsylvania campus. Bobby also shares his knowledge and enthusiasm for food through his cookbooks and cooking programs. His ninth cookbook, Bobby Flay’s Burgers, Fries and Shakes (Clarkson Potter), hit bookstores in April 2009, and Bobby Flay’s Throwdown! (Clarkson Potter), the companion to the popular primetime series featuring recipes from both Bobby and his challengers, was released on October 2010. Since debuting on Food Network in 1994, Bobby has continuously hosted programs that bring cooking tips and information on American regional fare to a national audience. His first show, Grillin’ & Chillin’, premiered in 1996, followed by Hot Off the Grill in 1998 and Boy Meets Grill in 2003. Along with participating in many holiday and seasonal Food Network specials over the years, Bobby currently stars on Iron Chef America (premiered 2005), Throwdown with Bobby Flay (premiered 2006), Grill It! 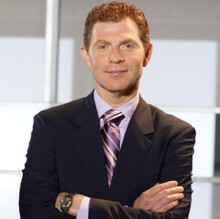 with Bobby Flay and Food Network Star (both premiered 2008). In fall 2010, Bobby expanded his television presence to Food Network’s sister network Cooking Channel with the debut of Brunch @ Bobby’s. Do you want to hire Bobby Flay? Directly request a quote. In 48 hours we can send you the availability of Bobby Flay If you would like to book Bobby Flay, Entertainment Booking Agency is the right place. We will offer you the best price and contact the management or we directly contact Bobby Flay. For corporate appearances or speaking engagements you can contact our agents and the will help you true the process. Tags: hire Bobby Flay, Bobby Flay booking, book Bobby Flay, Bobby Flay appearances, find more information on booking Bobby Flay for appearances, Bobby Flay speaking engagements, Bobby Flay endorsements/spokesperson, Bobby Flay appearance fees, Bobby Flay booking agency contact info, biography of Bobby Flay, Contact an artist booking talent agent find a speakers bureau that can book Bobby Flay, speaker booking agency for Bobby Flay, Bobby Flay booking agency, Bobby Flay booking for corporate event. EBA is one of the biggest entertainment booking agencies in the World. We book hundreds of celebrities, artist, athletes and speakers in a year. Important to know is that we are not claiming to be the management of Bobby Flay. We are not the official agent for Bobby Flay. Companies from around the globe book these artists and speakers true our company be course we have one of the biggest networks and we always have direct contact with the artist or the management. We help you to find the right celebrities for your corporate of private events. Please contact one of our agents to get free advice and we will help to get the world-famous artist on your party.